On the 19th of December for the eight year Investment and Development agency of Latvia in cooperation with Economic ministry organized contest „Export un innovation award 2012”. 28 most successful and innovative companies of Latvia were nominated in five different categories. For this year’s contest there were submitted 114 applications from Latvian companies. Best and most successful companies were nominated in categories: „Champion of Export”, „Exportable Merchant”, “Industrial Design”, “Innovative Product” and “Import Replacement Product”. JSC SPODRĪBA won 2nd place with new product line „ECO SEAL FOR NATURE” in contest nomination „Innovative product”. “ECO SEAL FOR NATURE” product line includes 9 ecological washing and cleaning products: ECO laundry universal, ECO laundry colour, ECO laundry black, ECO dish wash balm, ECO universal, ECO bathroom, ECO floor, ECO WC and ECO cream soap. All “ECO SEAL FOR NATURE” products are free for phosphates, dyes, allergens and other harmful additives, washing substances decompose biologically. The new products are concentrated and highly effective; therefore it reduces usage and is therefore better for the environment. Director of Investment and Development agency of Latvia Andris Ozols during the ceremony stressed out, that business gets success, because they are able to think in bigger categories – set bigger goals, they are able to act and act for today without postponing things. And the most important – they love their work and they are working with passion. For those who received first and second places in each category will have a chance to participate as a merchant delegation member in higher official abroad visits, as well as participate in Investment and Development agency trade missions or individual business trips for free. Each category first three place winners and champion of export receive the possibility to place on products and use in marketing activities specially designed quality standard label. All successful businessman of Latvia where gathered in cinema „Citadele”, where the award ceremony was held. In the ceremony participated „Export and Innovation award 2012” patron and president of Latvia Andris Bērziņš. Unforgettable musical moments were provided by pianist Lauma Skride and vocal group „Latvian Voices”. Purpose of „Export and innovation award” is to express appreciation and honour Latvian companies, which has received good results creating new, exportable products and ensuring local market with high quality in Latvia made products. 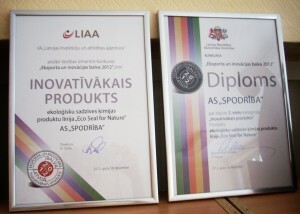 For nomination “Innovative Product ” 1st place was received by Ltd, „Tilde” with machine translating technology “Lets MT!”, 2nd place – JSC „SPODRĪBA” with ecological house cleaning and tending product line “Eco Seal for Nature” and 3. place – Ltd. „Madara Cosmetics” for anti – aging cosmetic product line “Time Miracle”. On 26th of December at 17.oo awarding ceremony will be broadcasted in 1. channel of Latvia Television.